Root canal therapy is a very successful treatment procedure; however, there are a few cases where the infection persists after initial endodontic treatment. There is one last effort that can often be performed to preserve the tooth: an Apicoectomy. An apicoectomy is a minor surgical procedure in which the chronic infection and the tip of the tooth’s root is removed (apico apex or end; ectomy removal) and sealed. This procedure is commonly performed by an endodontist. To have an understanding of endodontic surgery, it helps first to know something about the nonsurgical endodontic procedure. Root canal treatment is necessary when the soft inner tissue or “pulp” of the tooth becomes inflamed or infected. This may happen as a result of deep decay, repeated dental procedures on the tooth or a traumatic blow to the tooth. In a few cases, however, nonsurgical endodontic treatment alone cannot save the tooth. In such a case, your endodontist may recommend surgery to help preserve your tooth. In this procedure, the endodontist opens the gum tissue near the tooth to see the underlying bone and to remove any inflamed or infected tissue. The very end of the root is also removed. 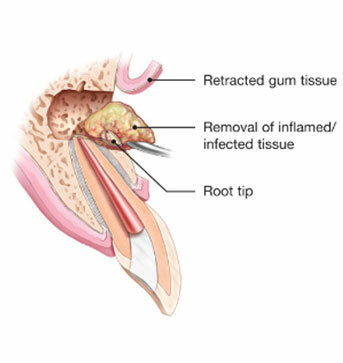 A small filling may be placed to seal the end of the root, and a few stitches are placed in the gum to help the tissue heal properly. Over a period of months, the bone heals around the end of the root. Apical surgery can help save your tooth in a variety of situations. Surgery may be used in diagnosis. If you have persistent symptoms, but the problem can not be revealed on x-rays, your tooth may have a tiny fracture or canal that could not be detected during nonsurgical treatment. In such a case, surgery allows your endodontist to examine the root of your tooth, find the problem and provide treatment. Sometimes calcium deposits make a canal too narrow for the cleaning and shaping instruments used in nonsurgical root canal therapy to reach the end of the root. If your tooth has this calcification, your endodontist may perform endodontic surgery to clean and seal the remainder of the canal. Usually, a tooth that has undergone a root canal can last the rest of your like and never need further endodontic treatment. However, in a few cases, a tooth may fail to heal. The tooth may become painful or diseased months or even years after successful treatment. If this is true for you, surgery may help save your tooth.